As of Sunday, July 1st, Superintendent Reymundo Reyes is the new Officer in Charge of the Coastal Executive Unit (Ambergris Caye and Caye Caulker). The senior officer took over the position held by Superintendent Henry Jemmott, who was recently transferred to the Capital City of Belmopan. 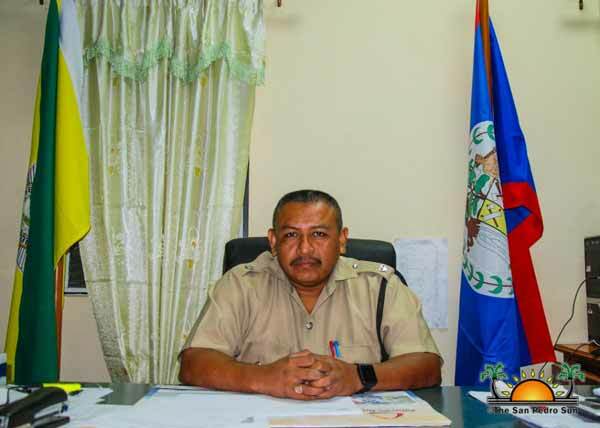 Reyes comes to the Cayes with 21 years of experience in the police department, and looks forward to working along with the community to achieve the common goal of both islands’ well-being. Originally from the village of Xaibe in the Corozal District, Reyes joined the ranks of the Belize Police Department in 1997. After graduating from the Police Academy in Belmopan City, he was posted at the police headquarters in the Capital City for six years and earned the rank of Corporal. Reyes was thereafter transferred to Corozal Town where he served for just one year. His next post was in Dangriga Town in southern Belize, where he exercised the role of an Acting Sergeant. He explains that after four years in the cultural capital of the country, he went to San Ignacio, Cayo District for seven years. Reyes stated that he has 11 years of experience in investigative work and believes that this qualification will greatly benefit the island. He has started to introduce himself to members of the island community and found out that there is not much of a close relationship with the police. “One of the first things I want to implement is police officers to have much interaction with the people,” said Reyes. “By working with the community, we can for sure get a better result. The island is not that big, and most people know each other, so when they see an unknown person or a crime in the process they can quickly assist the police with information.” Reyes says that this new post is a challenge, however, he expects to deliver with the limited resources the Department counts with.